David O. Russell's previous collaborations with a similar cast to Joy all proved successful for similar reasons. Russell has acquired himself a wonderful collection of actors that truly commit to the characters he gives them, and his exuberant and fun direction generally allows them to shine. Silver Linings Playbook set up a genuinely warming story and gave its three leads some emotional material to play with, and American Hustle's fun, exciting tone combined nicely with characters that were noticeably different to anything these actors had played before. Joy is the third consecutive film by Russell to star Jennifer Lawrence, Robert De Niro and Bradley Cooper, and it's the third success for the four of them. This might not be as well rounded as their previous two films, but it's also the most simple, and in some ways its the most effective. The cast have never been better, but, oddly, the only thing that lets this film down is Russell's direction. Joy's story is as simplistic as they come. Joy (Lawrence) is a single parent living in an overcrowded and shabby house who has failed to reach her potential. However she soon comes up with an invention (a self-wringing mop) that she believes could be a huge success, so she attempts to get the product on the market and achieve the life her grandmother always told her she was destined for. Perhaps its the simplistic nature of the story that has led Russell astray, after all his direction here is the most scattershot it's ever been. Admittedly, there are a few sequences in the film that are quite emotional, and some that are pretty funny, but Russell also offers random bursts of surrealism as Joy imagines her and her family inside the world of the soap opera her mother is addicted to. Scenes like this have the makings of something quite exciting, but Russell doesn't approach them with enough conviction. They're left feeling misplaced and unwanted, and serve little to both the film's narrative and its characters. Also whilst Joy does offer sporadic bursts of humour it's difficult to shake the feeling that this could - and definitely should - have been funnier. American Hustle excelled with its comedy, but here Russell again feels timid. The film begins with a title card reading "Inspired by the stories of daring women", and it's almost as if Russell is in fear of under-appreciating said daring women, and therefore frightened of allowing the film to veer too far into the comedic roots it's so clearly desperate to venture towards. Jennifer Lawrence and Robert De Niro are excellent with comedy, they have both proven this in Russell's two films prior to this, so it's extremely frustrating to watch their potential wasted, especially in a film that talks so frequently about achieving your potential. Perhaps it was in fact Russell's intention for Joy to step away from the comedy that has boosted so many of his recent films, or perhaps he was indeed cautious about passing off the women that inspired this film as simple comedy characters, but either way Joy desperately needed to be funnier. However, this simple story does benefit the film in a great way. Whilst the slightly more intricate narratives of Silver Linings and American Hustle clearly gave Russell firmer footing, they occasionally forced their characters into corners they shouldn't have ended up in. Joy's refreshingly simple tale strays far away from this, allowing its characters to remain true to themselves throughout, and creating a much wider spectrum for both range and development. Joy herself we see as a child before cutting to her as the divorced mother played by Lawrence, and it creates an affecting connection between viewer and character. The simple story means that Joy doesn't actually form the mop idea until about 30 minutes into the film, but this prior half hour is dedicated to familiarising the viewer with the characters and allowing us to understand who Joy is as a person, and why she has become that person who is so clearly different to the child that the film opened with. As the narrative progresses, Joy is undoubtedly the most compelling character, and it's the slow pacing and simplistic story that has allowed her to get there. But, obviously, it's also down to Lawrence herself. If there is anyone left who is still refusing to take her seriously as an actress, perhaps this is the film to change their mind; though anyone left unimpressed by her following the likes of Winter's Bone and the entire Hunger Games franchise needs their head checking. Lawrence, quite simply, becomes Joy, and she excels in both the quiet, understated moments as well as the big, shouty ones. She fully captures who this character is and what she represents, and gives a dazzlingly controlled performance throughout. Her supporting cast are all also excellent; Cooper might not have a lot to do but he makes the most of what he's given, and De Niro does a fantastic job of fluctuating his character between likeable and detestable. The wonderful job done by the cast of this film - Lawrence in particular - is, in fact, what makes this film's flaws so difficult to accept. Perhaps Russell is best when his stories have more substance and he can play around with the narrative structure more, because Joy finds his cast at the top of their game while he himself has now started to slip behind. 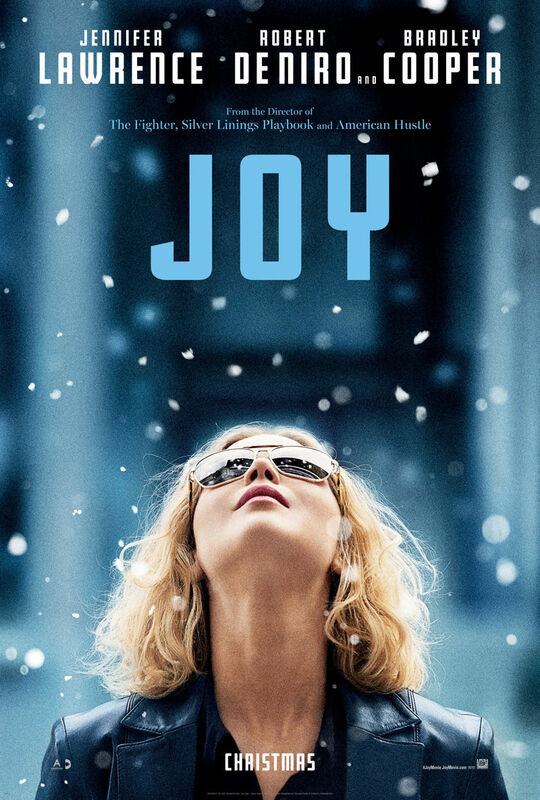 To Summarise: Whilst it's let down by an uneven directorial effort from David O. Russell, Joy benefits from its refreshingly simple story and a reliably stellar performance from Jennifer Lawrence.